Easter is a sure sign warmer weather and the beautiful colors of spring and summer are on their way. It’s also a great time to treat all your chicks and bunnies to something special with an egg-cellent Easter basket. Below are 100 easy basket ideas for little ones or tweens and teens. Get hoppin’! Jelly Beans - I scream, you scream — we all scream for jelly beans! Fill plastic eggs with their favorite beans or play a flavor guessing game and offer a prize for the winner. For extra fun, add in a few weird-tasting Jelly Belly options. Candy Bar King - Kids will love waking up to a basket filled with the king size versions of their favorite candy bars. Chocolate, peanuts, caramel? Yes, please! Cookie Cutters - Gear up to ready, set, bake with a cookie cutter basket. Choose Easter or spring-themed cookie cutters and surprise them with a huge array of frosting and sprinkles. C is for Chocolate - Create a wonderful world of nothing but chocolate with bunnies, ducks and other animals all made of what everyone craves. It won’t take them long to dig in. Cookies - If you have a Cookie Monster or two living in your home, a cookie basket could be just the thing. Fill it with their favorite snack or pack it with ingredients to bake their chewy (or crunchy) specialty. Harry Potter - Whip up a little magic with a Harry Potter basket. Surprise your favorite muggles with flavor beans, chocolate frogs and jelly slugs. Yum. Gum - Smack it, chew it and see who can blow the biggest bubble. Start Easter with a pop when you give them gum gifts of every size, shape, flavor and color. Don’t forget to include Bubble Tape and Big-League Chew! Lollipops - Sweet treats on a stick make for a beautiful and tasty day. You can special order lollipops with their names or initials or go all out with huge lollipops they can enjoy all week. PEZ - They are colorful and come in dispensers of all shapes and sizes. Pick a new favorite or go with a classic. Let your kids discover this creative and collectible way to eat sugar. Popsicle Molds - Get excited for summer with a popsicle basket. Grab some unique shaped molds and packets of flavoring and get excited for warmer days ahead. Peeps - Peeps and Easter go together like chocolate and bunnies. Marshmallow-y delicious peeps come in all shapes, sizes and colors and look great in any basket. We can’t promise they will be around long. Flavored Popcorn - Put some pop in your Easter basket with a variety of flavored popcorn for the win. The flavors are limited only by your imagination. Fruit Snacks - If their favorite go-to snack is made up of chewy fruit, wow them with an entire basket of sweet goodness. From cars to marine animals, you can find a tasty treat to suit all their interests and tastes. Cupcake Garden - Frost an array of pastel-colored cupcakes (flavors up to you!) and arrange them in a basket resting on green shredded paper for a tasty garden. Fave Food - You know it’s going to be a good day when you wake up to a basket full of your favorite foods. Bring on the cereal, mac and cheese or cookies. Whatever makes them smile, pile it on for an easy basket they will love. Lunch Box - If they need a new lunchbox, make it their Easter treat. Unzip the top and fill the lunch box with every treat they love. Mug - A warm sweet drink in a personalized cup is the perfect Easter gift. Find a mug you know they will love (or decorate one yourself) and fill it with a variety of tea, honey and sugar — everything needed for a warm treat. If they don’t care for tea, choose a variety of hot chocolate mixes to satisfy their sweet tooth. Ice Cream Fun - It’s always the right season for ice cream. Keep the creamy stuff in the freezer and fill their baskets with flavored cones, sprinkles, hot fudge, walnuts and everything that makes a sundae bar delicious. Box o’ Treats - Forgo the Easter basket altogether and keep them guessing (and busy) by building a tower of treats. Find boxes of varying sizes to fill with treats, then wrap and stack to make a tower. They will love unwrapping each sweet surprise. Legos - Legos are a simple gift that packs a big punch! Kids of all ages will dive into constructing towns and cities, recreating scenes from The Lego Movie and building up their next big adventure. Dinosaur Basket - Give them something to roar about with a dino basket. Fill it with plastic figurines and dino eggs or give them tools to go digging for dinosaur bones in the backyard. Have a Ball - Perfect for the toddler set! Fill your little one’s basket with soft balls of all shapes and sizes and let them toss, throw and put them in and out of the basket all afternoon. Bubbles Basket - There can never be enough bubbles, no matter how old (or young) you are. Kids will love finding bubble wands and other activities in their basket. Dr. Seuss Basket - A Seuss-themed basket is appropriate for all your Easter loves from toddlers to teens. Use Seuss’s crazy colors and signature whimsy to create something extraordinary. Go with a “Green Eggs and Ham” or “Oh the Places You’ll Go” theme. Disney - With Disney in your basket, the possibilities are endless on any budget. Wow them with a princess or “Cars” theme, or pick a favorite movie and delight them with stuffed animals and fun characters. Dress Up - A fireman’s hat, a tiara or two and some sparkling shoes make for an original Easter basket and lots of ways to play dress up. Scout your local consignment stores for glittery dresses, costume jewelry, ties and hats! Sticker Basket - Happiness is a basket overflowing with stickers. Give them a sticker book or let them trade with each other or add favorites to their private collection. Tool Set - If they like to build the day away, put a smile on their face with a plastic tool set. Create a list of home repair projects so they can get to work using their hammer, nails and screwdriver. Emoji Basket - Pack a basket with smiles, winks and hearts. It can be a snuggly emoji pillow for their bed, a new game or jewelry. You can find anything with just the right emoji on it! Sports Basket - If you have a busy athlete in the family, a basket filled with a new basketball, tennis balls or swimsuit is the only way to go. Include tickets to an upcoming professional game to make the day special. Minion Theme - They are cute, yellow, look great in denim and are always up to something. Why not bring some silliness to Easter morning with a minion theme? From candy to movies, figurines to bandages, you have a lot of choices to create the perfect basket. Doctor - If your little one likes pretending to be a nurse or doctor, give them all the supplies they need to run the best hospital on the block. Include a stethoscope and plenty of bandages. Dancing Basket - If you have a little ballerina in your house, make their pink tutu dreams come true. Use the tutu as a basket and fill it with glittery shoes, a new leotard and fluffy candy. Superhero - Give an Easter basket with a pow and a wham! From Batman to Spiderman or the Green Lantern, ignite their imagination — and fulfill their candy dreams — with this easy go-to idea. Stuffed Animals - Cute and cuddly is always a winner. Buy some stuffed animals and put together the perfect safari, farm or marine scene for an adorable basket. Star Wars - Star Wars is always a hit. Your junior Jedi will love toys, puzzles, coloring books, dress-up clothes or anything Star Wars! On the Farm - Do you have a toddler who loves making animal sounds? Treat them to a farm theme basket with cows, pigs, horses and their favorite barnyard friends. Under Construction - Use the back of a large plastic dump truck to put treats and goodies then let them head outside to start on their next project. Tattoos - Press-on tattoos are fun for kids of all ages and easy to put on and remove. Most local party supply stores carry these items in all sorts of themes your little one is going to love wearing. Get Coloring - Is there anything better than a fresh coloring book and a shiny new box of markers? This idea is sure to keep kids busy and inspire new works of art for the refrigerator. Journal - If you have a tween or teen, consider giving him or her everything they need to start writing. Fill a basket with a journal to match their style and gel pens of many colors. Slime - Order a slime-making kit online, find it in a big box store or gather the ingredients yourself. Art Break - Empower your budding artist when you replenish their supply of paint, brushes, glitter, markers and tons of paper. Play-Doh - Keep them busy and watch what they can create with new Play-Doh clay and accessories. Musical Basket - Feel the beat with a musical Easter basket. Let them try the kazoo, harmonica or drums. We advise earplugs for the audience. Decorate a Placemat - The kids won’t mind setting the table when they can show off their new placemat. Include a decorating set in their basket of goodies and they will come running to the table. DIY Kits - Stay busy over the Easter holiday with do-it-yourself kits. Visit your local craft store to choose from DIY remote control car kits and wind chimes packets, to creating personalized bug catchers with paint or stationary with stamps. There are a lot to choose from, on any budget. Space Cadets - Let their basket take them out of this world and beyond. Go galactic with glow in the dark stars, model planets or a rocket ship 3-D puzzle. Duct Tape - Duct tape isn’t just for home improvement projects. Purchase several rolls of duct tape in funky colors and include a DIY book. Your tween or teen will stand out with their new duct tape purse, wallet and other awesome accessory. T-Shirts - Give a gift that won’t ruin their teeth or their appetite. Purchase a few plain T-shirts and colorful puffy paint or markers and let them spend the day making their new favorite outfit. Colors - Coloring books aren’t just for the little ones. Give your tween or teen an adult coloring book with a pack of gel pens — the perfect gift for relaxation and fun. Pencil Pouch - Get them excited about going back to school with a new pencil pouch, Easter style. Find their favorite color, design or theme and pack it with their favorite sweet treats. Monogram Magic - If they are into their monogram, give them a basket to suit their style. Order stickers of all shapes in sizes with their name or monogram and let them decorate the day away. Mason Jar - A mason jar basket is as classic and pretty as it is useful. Use one large jar or two or three smaller jars. Write his or her name on the outside and fill it with everything creative that they love. Sock Basket - Replenish their sock drawer with a colorful and crazy sock basket. Pizza, baseball, cartoon characters — your choice of design is almost limitless. If you can’t find what you want in a store, check online for even more options. Hair Fun - For this cute and practical Easter basket, stock up on brushes, hair ties, clips, scrunchies and other hair accessories. This idea works well for tweens and teen girls. Rain Boots - Line the inside of a pair of rain boots with a shower cap and fill with holiday treats. After the goodies are gone, their feet will stay warm and dry no matter how many puddles they find. Hats Off - Order a baseball cap or floppy sun hat and line it with traditional Easter grass then stack on the treats. They can wear their Easter gift all year! Umbrellas – For a fun twist, flip an open umbrella upside down and fill it with rainy day activities and yummy treats. Bath Time - Make bath time fun time with a basket filled with rubber ducks, bath crayons and other activities. Sleeping Bag - Get them ready for their next sleepover or camping trip when you load up a sleeping bag with candy and other sugary goodness. Smile - The dentist is sure to give you two thumbs up with a basket that will keep their teeth strong and healthy. Don’t forget the flavored toothpaste, floss and a cool toothbrush. Flash Cards - School is in session with this brainy idea. Dive into summer learning with vocabulary or math flashcards. Trust us, they will thank you (eventually). Warm Up - By the time Easter rolls around you may not be quite done with snow and ice. Consider giving them a colorful outerwear basket with new gloves, scarves and hats for the end of this season and the start of next winter. Lip Fun - Keep them looking good with a basket full of lip balm, lip gloss and lipstick. Anyone’s mouth can stay moisturized and minty fresh with Chapstick and mints. Travel Bag - If they are ready for adventure, find a duffel or travel bag and load it up with things they will need when they are away from home. We like packing cubes, a laundry bag and toiletries for starters. Water Bottle - Kids of all ages will love this eco-friendly reusable gift. Decorate it with their monogram, school colors or favorite team logo. Pillowcase - Find a pillowcase that fits their personality and style and turn it into a one-of-a-kind Easter treat. It’s a useful and fun way to start Easter morning. Shower Caddy Basket - Give them a sweet place to keep all their bathroom stuff. A shower caddy is perfectly designed to hold candy, treats and shower supplies. Chef Basket - Get cooking with a chef-themed basket. Flip a chef’s hat upside down and fill it with kitchen goods like cupcake decorating supplies, a small cookbook, measuring cups and more. Magazine Basket - If your tween or teen is into cooking, fashion, science fiction or anything in between, there’s a magazine sure to interest them. Purchase a magazine for their basket and include a yearlong subscription. Educational and useful! Feed Me - If you have teens in the house, you know they can turn into eating machines. Give your favorite muncher a gift card to his or her favorite fast-food place, deli or dessert stop. Coupons - Make homemade coupons redeemable for everything they love to do. From heading to the movies, roller skating, getting a ride to the mall or going to a festival or event, this idea is an excellent fit for all ages. Road Trip - If the spring season calls for a road trip, get everyone excited with a basket stocked with things to do on the road. A book from a favorite author, a gift card to download a new game or music and a fresh pack of playing cards will make the trip fly by. Sand Pail - Headed to the beach for a break? Purchase a sand pail at any low cost or big box store and personalize it with their name. Fill it with shovels and sand shapers of every size and color — including a few pieces of candy for good measure. Balloons - Make the fun last when you put small trinkets, candy and gifts inside balloons and hide them around the house. The kids will love finding the surprises and popping the balloons to see what’s inside. Game Night - Everyone will be ready for the next round of game night with a basket filled with UNO cards, Go Fish or Trivial Pursuit. Mad Libs - There’s a reason everyone gets excited when you break out Mad Libs. 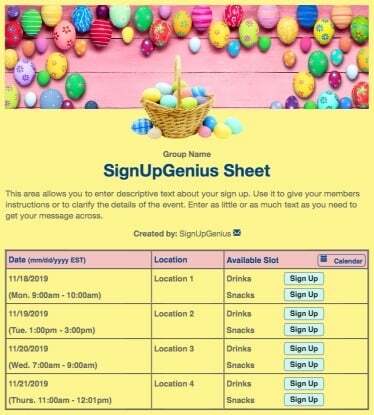 Spend Easter morning laughing as you take turns filling in wacky nouns, verbs and adjectives to create a crazy story. LOL! - Sometimes the best gifts are the ones that get you laughing until milk comes out of your nose. Get everyone chuckling when you put a basket together with knock-knock joke books and funny stories to read aloud. Spa Day - Rainy spring days mean indoor spa fun. Keep the basket colorful with pastel nail polish, mud masks and cozy socks for extra pampering. Your tween or teen girl will love this idea! Puzzles - Put the perfect Easter gift together with a puzzle. Keep it holiday or spring themed and enjoy some quality time together. Glow Stick - Fire up some Easter evening fun with a glow stick basket. Stock it full of glow bracelets, necklaces and other bright accessories to light up the night. We suggest a game of glow stick backyard tag. Camping Theme - Outdoor time is a fun time when you bring out the flashlights, marshmallows and roasting sticks. Whether you head into the wilderness or the fire pit in your backyard, this is a great way to spend some time together. Go Fly a Kite - They will be ready to head outdoors when you surprise them with a kite kit. You can also assemble the kite and use it as a basket. We love this high-flying idea. Bath Bombs - What is it about these fizzy, fragrant balls of relaxation that makes stress melt away? They come in all shapes, sizes and colors and are perfect for an after-Easter chill session. Religious Basket - A book about the true meaning of Easter or a daily Bible verse calendar are wonderful ways to celebrate the season. Gift Cards - Not sure what to get your tween or teen for an Easter treat? Gift cards are always the right answer. Movie Night - Let the fun of the day spill into the evening with a movie night basket. Include popcorn, candy, soda and a movie encyclopedia so you can find your next favorite flick. Lemonade Stand - Easter is here and summer lemonade stands aren’t far behind. Fill up their basket with items to run a successful roadside business with lemonade mix, colorful cups and poster markers for making an eye-catching sign. 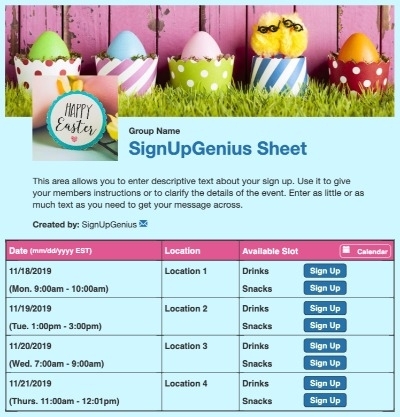 Scavenger Hunt - Make them work for their Easter goodies. Start the adventure with a clue of where to find the first treat then send them on an adventure around the house or yard. Circus Basket - Life is better under the big top, and Easter is no exception. Up the amusement factor with peanuts for the elephants, cotton candy for the audience and a center ring with stuffed lions, tigers and bears, oh my! Include tickets to an actual festival or circus. Water Fun - Turn their Easter basket into a splashing good time with a new pair of goggles, dive toys, fins and more. Flower Power - Get ready for spring by turning a flower pot into a playful Easter basket idea. Load it up with seeds, a gardening shovel and other tools to plant some magic. Get Outside - The weather is finally warming up and it’s time to get outside. Give everyone plenty to do with goodies like sidewalk chalk, jump rope, a yo-yo, mini golf set and more. Bird House - Spring is for the birds … literally. Put treats inside a birdhouse then after your flock has devoured the goods, scout out the perfect place to hang it outside and keep your winged friends fed all year. Egg Decorating Kit - Create a basket with everything they need to make sparkly and colorful eggs. Host an egg hunt then use them as the holiday centerpiece. Bunny Bonanza - You’ll make Easter a hoppy time for everyone when you fill a basket with bunnies of all shapes and sizes. Pile on the chocolate bunnies, marshmallow bunnies or a stuffed bunny to make it special. Bunny Slippers - What could be better than an Easter treat you can wear? Fill bunny slippers with candy and other goodies. Once the treats are gone, they can slip into something warm and cozy. Baby Pool - Get ready for the summer and give them hours of entertainment when you turn a baby pool into a huge Easter surprise. Fill it with lots of grass, toys and candy and watch their eyes light up. When it gets warm enough, take it outside and enjoy the day splashing around. Beach Towel - Wrap goodies in an oversized beach towel or blanket and tie up with a bow. Just the thing to be beach or pool ready! Keep it simple and fill a basket with items they love. It shows how much you care and will always be a hit. These 100 ideas should put some spring in your step and let every bunny know you are thinking of them this season! 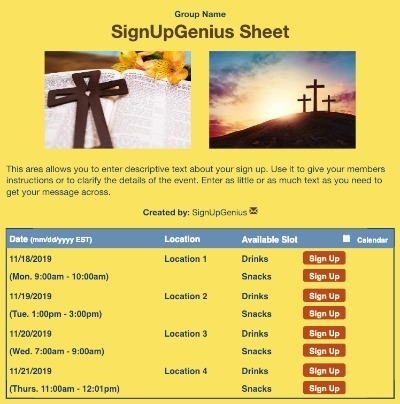 Organize your Bible study volunteers with a sign up.